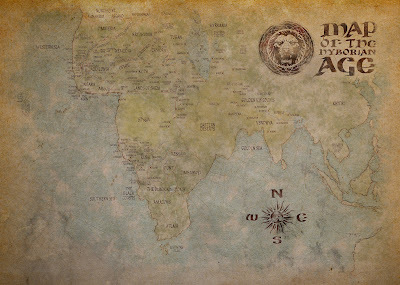 As a follow-up to my musings on Hyborian Age Cartography, there's been a veritable avalanche of activity on the subject at the Robert E. Howard Forums, and I simply have to share some of the results. I have my quibbles with this and Amra's map (viewable here), mostly in regard to the Black Kingdoms and the extent of change in the eastern lands, but it's by far one of the best extrapolations of the southern and eastern lands of the Hyborian Age out there. But ever since then, things have been getting very exciting. I've taken the liberty of uploading some of the images here to save bandwidth and for posterity, because this is really brilliant stuff. Those of you with slower modems, beware, for these waters are rife with large images! Some might say, sure, Al, everyone gets the cold, it's no big deal. And I'd agree. But this... this is no mere cold. It may have all the symptoms of the common virus, and it feels like it. But I know better: I know that there is something which has taken up residence in my head, and it means to torment and despoil my temperament. Decription? One might as well ask to paint a picture of "irritation," or "subtle," or "mischief." It does not dwell in our paltry human dimensions, but in a veil between worlds, where it can exude its dripping malfeasance without physically occupying room in my brain: that makes it safe from prying foreceps and particularly violent sneezes. All the while wheezing and squeaking with unspeakable glee at the havoc It is causing. (This extrapolation of the immune system brought to you by 8-year-old Aly, though by no means the only one) In other words, I have a cold, I'll get back to you, I really think someone could make a fun Sword-and-Sorcery story using the immune system as a setting. Educational and fun! In keeping with the Caspakian theme, welcome to Art of Time's Abyss! Since I've been concentrating on work off the 'net, I want to keep contributing without spreading myself too thin. So, to remedy that, I'm starting a new series. Normally the devil's advocate in me would be inclined to go against the grain despite personal opinions. A tiny part of me actually wants to defend Lolos' art: if nothing else, it's certainly different. However, I must draw the line at defending something simply because it isn't the very worst: something doesn't have to descend below Bennet's "God-Fall" to be subject to criticism. Yes, there have been bad issues in the past with Conan - after decades of top-quality material from Thomas, Smith, Buscema, Alcala, etc. I won't say Thomas was perfect, that he had no off-days, or that Smith's early work was inferior to his later work, or that they didn't have a bumpy start - but they were doing pretty solidly for many years before The Dark Times. is a panel of the main Conan comic series. I'm going to break my moratorium to shock you all: I don't hate Lolos' art. I don't particularly care for it, and I think the constant off-model characters are distracting. But I'm not going to go so far as to say his art is bad, because he clearly has an eye for expression, his scenery is competent, and he has a definite style. That's something. But at the same time, this is the main Conan the Barbarian line, taking one of the most ambitious and important story arcs in the character's entire life. "Something" isn't enough, this has to knock it out of the park. Lolos isn't doing that: he isn't even playing baseball. This would be fine for a one-off, a Daughters of Midora or Songs of the Dead. 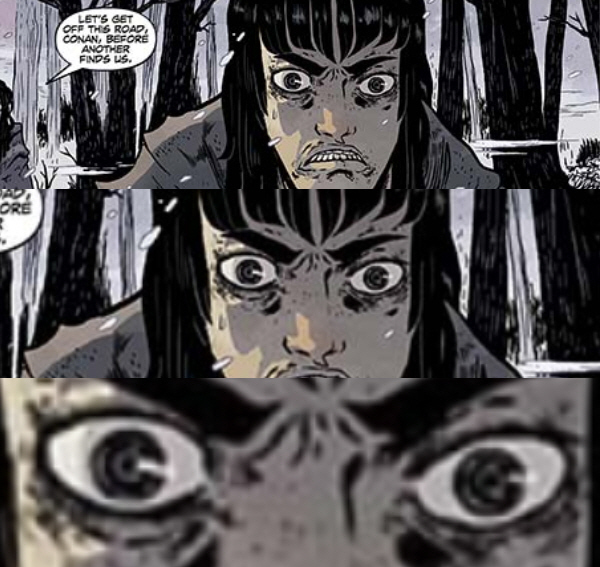 But what happens in these issues affects every Conan comic in the Dark Horse series that follows until the very end. This series acts as if exists in a vaccuum instead of being part of a long-running series with an established continuity, which means that everything Busiek and Truman did is essentially forgotten. 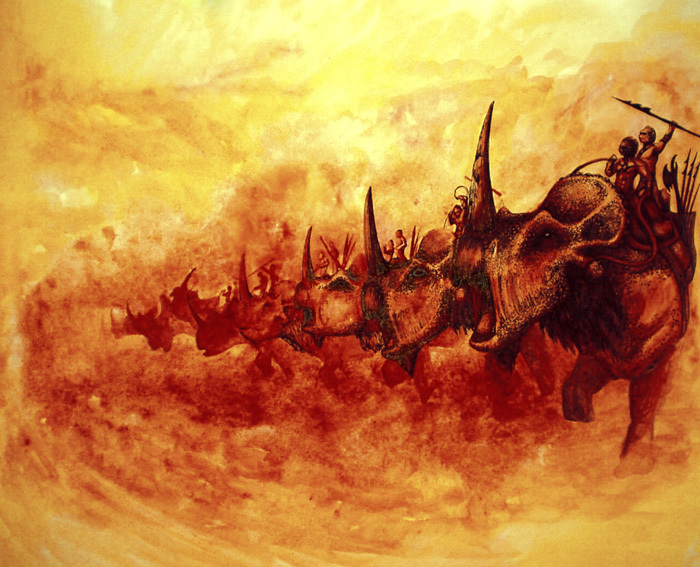 Wood's Conan never commanded the armies of Khoraja against Thugra Khotan; he never captained the Saucy Wench; he never freed Yogah; he never became friends with Nestor. And when Wood's off the series, what then? Will another author continue with Wood's alternate-universe Conan, or will we get yet another reboot, only this time the massive potential of "Queen of the Black Coast" has passed by? Yes, yes, Conan has survived the '90s, he'll survive this. That's not in question: what is in question is the potential of something truly special being wasted. And I do think the potential of "Queen of the Black Coast" is not being exploited by Dark Horse. 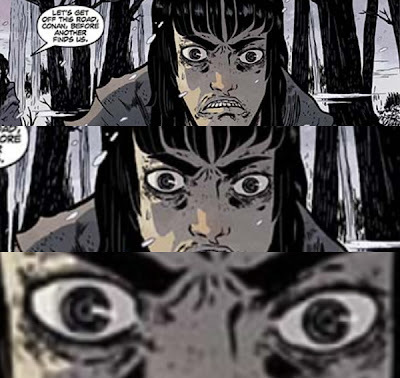 With all due respect to Wood, the fact that he's explicitly working with such a limited pallet as the original story (possibly mandated by Dark Horse) means that we've had 8 issues of a series about the Black Coast, with three issues that are actually set on the Black Coast: three issues go back to Messantia, which has been covered in the previous arc, and two issues in Cimmeria, which was the setting of two major arcs in the past few years. We still have the current Cimmeria arc to finish before we get to the next arc, which finally takes us back to sea. So Conan: Daughters of Midora and Other Stories is out, and much like recent Kull, Solomon Kane and The Road of Kings collections, it's a trade paperback I'm not in a particular hurry to purchase, even if it includes a brand new story exclusive to the book. Zach Davisson has a review up, and it's fair to say he and I have rather divergent viewpoints on some aspects of Howard adaptations and pastiches. Case in point, he loved Conan and the Daughters of Midora, the banner story in this collection, which should tell you something about the quality of the pieces therein. * I... Well, I wrote a rather cynical review of it for the fifth issue of my REHupa 'zine. And since the collection's out, it seems timely to dredge it up again. I should note that this was written in late 2011, so some of the references are a bit dated: I'm not collecting the main Conan title any more, and Savage Sword of REH has started getting on with Howard adaptations.